Boots are one of the few shoe types that I rarely find a reason to discriminate against. Tall, short, suede, leather, studded, buckled—I simply love all styles all the time. However, on the days that I'm required to walk any distance further than the 50 steps from my desk to the office kitchen, I have to leave my heeled boots at home in replace of my favorite flat options. Luckily, there is no shortage of stylish low-heel (I'm talking under 1 1/2 inches), ankle, calf-height, and over-the-knee boot styles on the market. As Nancy Sinatra sang, these (37!) boots are made for walking, and that's just what they'll do… once you shop them below. 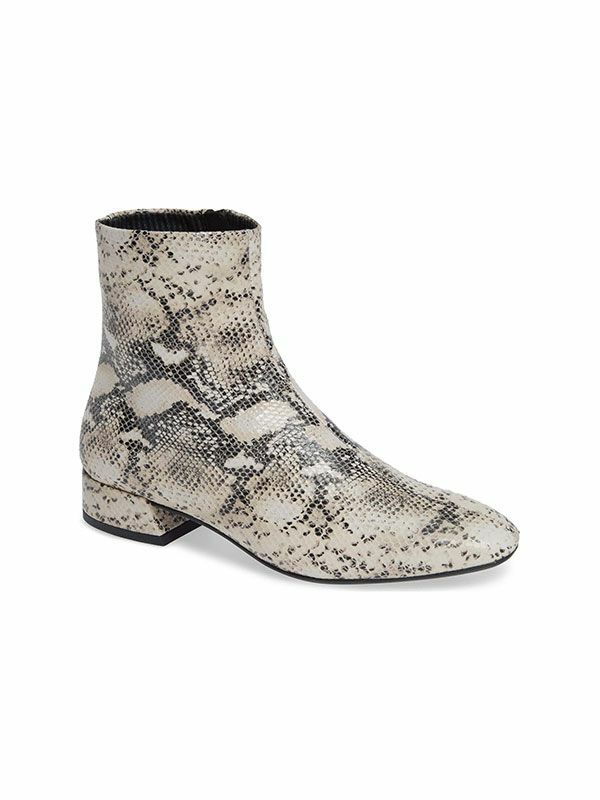 These snakeskin boots look way more expensive (as in three-times-their-price-tag expensive) than they are, but I won't tell. Leave it to Alexander Wang to make yet another pair of sleek booties I need. The zipper details add just the right amount of edge. Looking for less edge? Try booties with a leather ruffle trim. Metallic cowboy boots receive a definite yes from me. Buy these in honor of all the haters who say black and brown don't work together. This is what happens when comfort meets chic. Wear these with jeans, plaid pants, floral dresses… The list goes on. These distressed combat boots are perfect for the weekends. How buttery does this leather look? Simple studs for the win. For the days when settling on either the animal print or the Western trend isn't an option. This muted color makes these casual boots feel really elevated. Here's another perfect thing that Ganni made this season. Studs, fringe, texture—I want it all thanks to these fun booties. Just add skinny jeans and a sweater for an easy five-minute look. I'm upgrading my basic black ankle boots with these perforated beauties this season. These luxe boots are at the very top of my fall wish list. Not that I'd be wearing heels in the rain to begin with, but these sleek rubber boots will certainly make sure I can walk around with ease. I love the two textures of these luxe navy Chelsea boots. I know what you're thinking, and no, I can't believe these tall boots are under $100 either. I'm predicting these boots will be spotted on at least a few It girls the next time it rains in NYC. There's nothing not cool about these shearling off-duty combat boots. I'll be wearing these to the office all winter long. Just because the heel is low doesn't mean the heel shouldn't be fun. More under-$100 boots in my shopping cart. These lace-up boots look super chic paired with long dresses. There is no such thing as owning too many white boots. See above for proof. These brown snakeskin booties are refreshing in a sea of gray options. Olive green boots look super chic paired with an all-black outfit. Finish off your favorite "groutfit" with these. Almost every editor owns these timeless over-the-knee boots. I can't decide if this color skews more gray or more tan, but I love it nonetheless. A little sparkle goes a long way with these kitten-heel boots. I promise that navy boots are just as versatile as your black ones. The easiest way to add a pop of color into a fall outfit. Why are shoes that look old so much cooler? Up next: the best boots-and-jeans outfits to try this fall.